SUBIACO and Swan Districts remained unbeaten after two rounds in the Western Australia Football League (WAFL) Colts competition, while Claremont had the bye and will be looking to do the same in round three. In South Fremantle’s opening game they met a clinical Lions outfit, while Perth and West Perth were other winners from the weekend. Perth bounced back from its opening round loss to record a huge 63-point win over East Fremantle away. Luke English had the ball on a string, with 33 disposals, seven marks and eight inside 50s, also capitalising in front of goal with three majors. Deven Robertson was equally as influential through the midfield, also collecting 33 disposals, taking six marks and laying five tackles. Speaking of tackles, Sydney Stack was glued to his opponents in the match, laying a game-high 13 tackles to go with his 24 disposals and seven inside 50s. Others that impressed for Perth were Ethan Hansen (24 disposals) and Maverick Hamilton (22 disposals and a goal). For East Fremantle, Trent Rivers was the sole ball winner in the 20’s – registering 20 disposals, six marks and two tackles, while Corey Robinson (18 disposals, two tackles, four inside 50s and a goal) could also hold his head high in the loss. 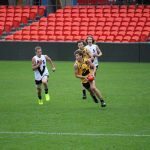 The Falcons got a vital win against their east-town counterparts, with a three goals to zero final term seeing West Perth run away from the Royals. West Perth had no shortage of big ball winners, with Tom Medhat collecting 33 disposals, 12 marks, four inside 50’s, laying eight tackles and booting a goal in a best on ground performance. Bailey Chalmers was not far behind him, amassing 29 disposals, 10 marks, four tackles, four inside 50s and booting a goal. Nathan Murray (29 disposals, four tackles, one goal), Koopah Todd (26 disposals, six marks) and Filimone Muavou (23 disposals, five marks) were others that impressed for the winners. For the Royals, Louis Miller was the highest possession winner with 22 disposals, while Jarrod Hamer-Matthew did his best with 21 disposals, five tackles and five inside 50’s. Excitement machine bottom-ager, Rhai-Arn Cox booted a goal from 13 disposals and two marks. Swan Districts remained unbeaten with a low-scoring two-point victory over Peel Thunder in their clash. Mitchell Bain racked up 28 disposals, three marks, four inside 50’s and laid seven tackles in the win. Harry Edwards (16 disposals, 11 tackles and 17 hitouts) and Jarred Cameron (15 disposals, 10 tackles) were others that brought the defensive heat on the day. Jackson Beck (25 disposals, eight marks, seven inside 50’s and a goal) was prolific, as were Graydon Wilson (22 disposals, five marks) and Riley Garcia (21 disposals, three marks). For Peel, James Sturrock had 22 disposals, three marks and eight tackles, while Jarvis Pina was the other player who had more than 20 disposals, with 21 touches, eight marks and three tackles, as well as driving the ball inside 50, four times. Bradley Oldfield (17 disposals, eight tackles) provided good defensive pressure, while Billy Chambers (35 hitouts) was strong in the ruck. The Lions proved too good for the Bulldogs in the latter’s first game of the season, in a clinical performance. Subiaco had just 32 inside 50’s to the Bulldogs’ 40, yet had 24 scoring shots, and averaged a scoring shot every 11.9 disposals. Luke Foley was prominent again with 28 disposals, five marks, four tackles, two inside 50’s and two goals. Liam Hickmott had 23 disposals and eight tackles, while brother Will had 22 disposals and five tackles. Zane Shellabear Healey was busy with 22 disposals and four tackles, while Xavier Peacock was the dominant performer in the ruck with 28 hitouts. For the Bulldogs, Kyle Hamersley had a promising opening game, amassing 27 disposals, six marks, five inside 50’s and laying four tackles. Tom Belchynden had 23 touches, seven marks and three tackles, while Jack Musika racked up 21 disposals, three marks and three tackles. Luke Moore was the Bulldogs’ key target up forward with 3.3 from 13 disposals and three marks. WESTERN Australia has remarkably pulled off back-to-back one-point wins over both Victorian teams to claim the division one title at the National Under 16s Championships. The third round of the division one championships concluded on Friday with the Sandgropers winning 11.8 (74) to Vic Metro’s 11.7 (73) in what was effectively the grand final after both sides headed into the final round unbeaten. With a couple of minutes remaining in the Vic Country vs. Western Australia game on Monday, it looked likely Vic Metro had sewn up the shield heading into the last game, but a three-goal spurt in the last two minutes saw Western Australia climb over the top of Country in an exhillarating one-point win. South Australia finished third overall after defeating Vic Country on the final day of the tournament to claim its first win. Across the tournament all sides had a number of players that fans are likely to hear more about in the coming years as they continue down the pathway to reach their goal of playing AFL. Western Australia played an exciting brand of high-intensity, high-risk, high-reward football. Among the players that impressed me were ruckman Luke Jackson from East Fremantle who was not too dissimilar to Brodie Grundy in his second efforts. While still a lighter framed player at 81kg, the 192cm ruckman moved really well for a taller player and depending on how his growth goes over the next few years, could become that prototype midfielder, or even that Mark Blicavs’ role switching between midfielder and ruck. South Fremantle’s Jack Musika also stood out with his penetrating kick and great skills. Having not seen any of this group of players before, against Vic Country he would opt for that difficult in-board kick and also set up a number of passes inside 50 providing his teammates with score assists. Luke Jackson was impressive in the ruck and around the ground for Western Australia with some good second efforts and movement for a bigger player. Others for Western Australia that stood out on the Gold Coast included East Perth’s Rhai Arn Cox, Claremont’s Liam Henry and Perth’s Tarkyn Brogan-Henry. Cox rose above the pack to clunk a mark with seconds remaining and win the game for the Swans against Vic Country. He is a lightly framed forward, but always looked dangerous inside 50. Henry buzzed around the ground and always looked creative, despite on occasions doing a bit too much and getting caught. Brogan-Henry got the West Australians off to a great start against Country, booting three goals in the first quarter and providing a target both up the ground and closer to goal. Vic Metro’s top star was Oakleigh Charger Noah Anderson, with the 16 year-old already a good size at 188cm and 83kg and looked to have plenty of develpment left in him. Anderson was Metro’s leading disposal winner with 26 against Vic Country in round one and finished as the Kevin Sheahan Medallist as the best player in division one. Naturally he also won the Vic Metro MVP Award for the tournament in a large field of candidates that could have been successful. Chargers’ teammate Matt Rowell who was another standout across the tournament. He showed off his versatility across the three rounds playing both inside and outside midfield, as well as kicking goals up forward and creating plays off half-back. Rowell’s unbelievable 31 disposals, nine clearances and four goals against South Australia on Monday was an example of what he could excite fans in the TAC Cup later in the year should he be selected by the Chargers. Rowell will likely be one of a number of Vic Metro players selected in the AFL Academy sides announced later in the year. Oakleigh is sure to have no shortage of talent over the next few years with the classy Dylan Williams really standing out with his smarts and strength overhead. Playing between midfield and half-forward, Williams hit the scoreboard and would remind a few of Jack Billings the way he clunked marks at 185cm against taller opponents. Vic Metro’s Matt Rowell was ultra-impressive for Vic Metro against South Australia. Others that stood out for Vic Metro included Sandringham Dragons’ duo Jack Mahony – who provided good run in transition and found space inside 50 while forward – and Andrew Courtney who at 197cm but just 76kg still has plenty of filling out to do but his ruckwork was impressive. Western Jets’ Emerson Jeka impressed up forward leading to the right positions and taking some good marks but his kicking was off, not making the most of his opportunities. He played down back as well and showed off his versatility across the ground. Eastern Ranges’ Mitch Mellis and Calder Cannons’ Daniel Mott were others that stoof out, although players like James Ross (Eastern), Jamieson Rossiter (Eastern) and Lachlan Rzanovski (Western) were also impressive. For South Australia, unfortunately the game I saw live at Gold Coast was not the best performance, particularly early on. The Croweaters were competitive apart from a couple of poor patches, but there was one clear standout for me. Cameron Taheny from Norwood was ultra-impressive playing all over the ground and using his penetrating left boot to kick out from full-back and launch goals from outside 50. He also worked hard defensively laying several strong tackles and providing good team pressure around the stoppages. His kicking was similar to Matt Suckling with more strings to his bow, Taheny did step over the goal line a couple of times which caused ball-ups in the goal square, but otherwise he really impressed me. South Australia’s Cameron Taheny was one of the more impressive players on the Gold Coast with a penetrating kick and ability to play anywhere. Other South Australians that stood out were Glenelg’s Will Gould, who at 98kg was outmuscling opponents at will, playing through the ruck and up forward. Gould was impressive in his second efforts and defensive presusre. Woodville-West Torrens’ duo Kysaiah Pickett and Harry Schoenberg also had their moments providing good run through the middle, with Pickett’s clean hands and turn of pace among the highlights. Norwood’s Mitchell Carroll made good decisions under pressure in the back half, while Eagles’ Jackson Mead was another who impressed with his pace, kicking and strength in the air. Sturt’s Josh Shute, South Adelaide’s Daniel Sladojevic – who really impressed up forward with his presence and booming kick – and the balanced Karl Finlay from North Adelaide – who won the South Australian MVP – were others I noted as performers in the match against Vic Metro. Vic Country also had a number of impressive players stand out across the tournament. For Country, forward pairing Izaac Grant (GWV Rebels) and James Schischka (Bendigo Pioneers) were high flyers that provided plenty of scoreboard impact. Grant despite weighing in at just 64kg, took several big grabs and was a reliable set shot for goal. Schischka worried opponents with his ability to crash packs and moved well for a taller 190cm forward. Dandenong Stingrays’ Hayden Young took out the Vic Country MVP Award, having a good combination of clean hands and strength at ground level, good momement and strong in the air. Young collected 26 disposals and had five rebound 50s against Vic Metro in round one. Gippsland Power’s Sam Flanders was influential early in the match against Western Australia, with the Vic Country midfielder seen competing for the ball here with Liam Henry. Gippsland Power’s Sam Flanders seemed to be everywhere on the Gold Coast and won plenty of the football, using it well in transition. He along with Power teammate Caleb Serong and Bendigo Pioneers’ Thomson Dow won their fair share of the football and will no doubt be names to remember in the years to come. Of all the Vic Country players, Tom Richardson (Geelong Falcons) really impressed me with a workman-like effort moving up and down the ground constantly, being that Nick Riewoldt roaming half-forward who was a really slick kick inside 50. He stands at 190cm and 79kg, a frame that could see him become that contested beast or key position forward in the next 18 months, both roles he could play really well.